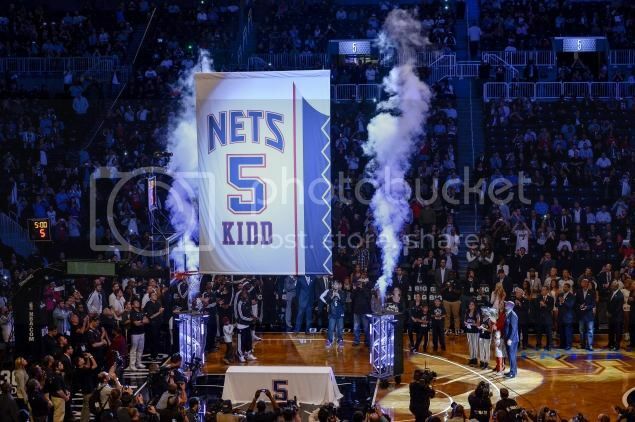 The Brooklyn Nets decided to honor one of the best players in the history of the franchise, Jason Kidd, by retiring his number 5 shirt. Jason is now coaching the Nets. His NBA career started in 1994 at the Dallas Mavericks, then moved to the Phoenix Suns and finally joined the Nets in 2001 (called New Jersey Nets back then). He played for the Nets until 2008, then moved to the Mavericks and finally to the Knicks last year. He was NBA Champion in 2011 and also picked in the NBA All-Star team 10 times. He also bagged two Olympic medals with the USA Dream Team. One of my favourite NBA players of the last decade, here's a video of his to 10 plays for the Nets. I think that was a great decision, to retire his number 5. He was a great player, really skilled, that video shows it. I agree pretty cool when a number is retired. Like I could never imagine someone wearing 23 on bulls. It's totally Jordan.